Apple announces AirPlay 2 with multi-room audio | What Hi-Fi? At its 2017 WWDC conference, Apple announced that the next update to its operating system, iOS 11, will bring with it a new version of AirPlay. Apple AirPlay 2 will offer multi-room support and the ability to stream music wirelessly to and between compatible speakers. Playback will also be controllable via an Apple TV box. The list of manufacturers signed up to AirPlay 2 is already impressive and includes established hi-fi brands such as Naim, Bose, Bang & Olufsen, Devialet, Dynaudio, Bowers & Wilkins, Bluesound, Denon, and of course the Apple-owned Beats. Apple's recently announced wireless speaker, HomePod, will also feature the technology. There's no word yet on whether the functionality will be backwards-compatible with first-generation AirPlay devices, but this certainly looks like a strong step for Apple into the world of higher quality music. 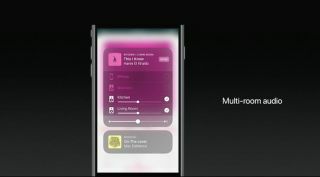 From the look of the iPhone's user interface, you can set speaker locations such as 'Kitchen' or 'Living Room', and then control which speakers are playing and set the volume for each one individually, as well as the master volume for the whole system. Manufacturers will be able to update their products using HomeKit for Apple Music - however, as many manufacturers have their own apps for controlling their speakers, it is unclear how functionality will be split between them. Apple also used its WWDC conference to announce that an app for Amazon Prime Video would be rolled out for Apple TV devices later this year. An app for the video streaming service has been a long time coming, but it doesn't look like it will support 4K video. For this, you'll need to access Amazon's app on a compatible 4K TV or video streamer. MORE: What is Apple AirPlay 2?